I think either one is a good restore project..They both have their good points and not as good points..I say you should fix up what ever tractor you like best. Here are some things to consider before you start fixing one up..What do you plan to do with the tractor and do you want it to be as close to original as possible or is mild changes ok? 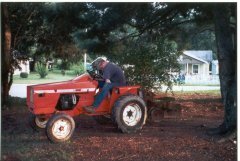 Here are some difference's between the 2 tractors that might help you decide what to fix.. 1)The 728 with 3 speed transmission has a rear PTO shaft to mount a pully for rear PTO powered attachments such as a Tiller or Lawn revitalizer.. 2)The 728's 3 speed has a better mowing speed than the 717's 2 speed (on the 717 1st gear is a little slow but 2nd is kinda fast for mowing) 3)If you use a snowblower..the 717 would need ( or in most case's should have) a HI/LO pulley kit as 1st gear is a little fast for heavy snow.The 728 1st gear seems to be slow enough.. 4)The 728 has more room under the hood and would be easier to mount a larger motor such as a 10-12hp..Can be done on the 717 with some cutting of the grille and hood but in most case's will mount in the 728 without cutting anything..very tight fit though.. The only thing I really like about the 717 is the looks..I like the older rounded hood style better than the flat hood of the 728..If you feel the same way and don't mind doing some swaping around some parts. You might consider mounting the 728 transmission into the 717..that way you get the older style with the more user friendly transmission.. These are just a few things to think about..There is probably more but these are things just off the top of my head that I could think of.. By far the most favorite small frame tractor I have is the Broadmoor 5010..Its just way more user friendly than any of the older ones with a little more HP too..The hood is on a hinge to to service the motor you don't have to remove the hood..just flip it forward..It alsohas a swooped forward front axle so it can handle a 42" mower deck rather than the 36"..The 10hp motor makes a big difference too..
Tom, funny yu say that because my 717 steers easier than my 728..But the 717 sat outside for years before I got it and the steering was almost rusted up..I had to take it all apart and grease everything up real well..Maybe thats the difference..Only thing I have seen different on the 728 is it has a full steering wheel rather than the half moon style.. Seems like the larger wheels would raise the front more than 3/4"?Also seems like you could get a roller bearing to fit in the Broadmoor wheels..However I don't think the bearings or bushings would make that big of a difference..probably more like the diameter on the tire making the difference..A larger diameter tire will roll easier than a smaller one..I plan to mount a larger (20x10x8) tire on the rear of mine and tri ribs on the front..